The Alabama Department of Transportation recently partnered with the Montgomery Bicycle Club by providing traffic assistance for its 12th Annual Glassner Autumn Challenge. Months prior to the Oct. 11 event, organizers contacted ALDOT to request traffic signal assistance at the intersection of U.S. Highway 31 and Federal Road in Montgomery County near Pintlala Baptist Church. The intersection is near the start of the ride and is the only signalized intersection along the ride’s five routes. With its Drive Safe Alabama initiative, ALDOT is dedicated to keeping Alabama’s roadways safe by providing traffic safety information, online resources and assistance to the public. Part of this emphasis includes bicycle safety and sharing information with community partners. Click here to see the most recent copy of ALDOT’s Bicycle and Pedestrian Plan. The 2015 plan is currently under development. 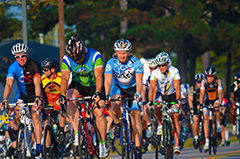 The Montgomery Bicycle Club promotes recreational and competitive cycling in Central Alabama. Members seek to increase bicycle safety and awareness by advocating bicycle-friendly communities. For more information, visit mgmbikeclub.org.